Turn Sam into an even deadlier warrior. 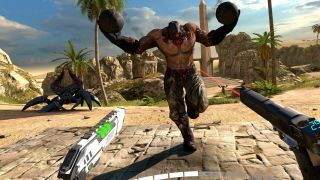 Serious Sam VR: The Last Hope, the virtual reality spin-off to Croteam's gloriously over-the-top Serious Sam series, has just received an updated Steam Early Access build that adds a couple of surprising new features. "For the first time in series history," the update notes explain, "Sam is not limited by his weapon handling skills and is able to annihilate even bigger alien armies thanks to the all new Skills and Power-Ups update." That's right, you can now enhance Sam's skills with the new skill tree, which allows you to unlock powerful abilities and weapons including holographic decoys, swarms of flying quadcopters, and "an army of spiders." I'll not be picking that one, ta very much. "With this update general Stone gains access to a skill tree that allows him to unlock passive and active abilities which players can buy alongside weapons and ammo in the shop," the Steam post elaborates. "Skill points are unlocked by completing planets. Higher difficulty levels bring even more points that players can use to set up their skill inventory to better match their play style." If that's not enough Sam for you, the top-down Serious Sam's Bogus Detour released last month.